On Saturday 29th November a group of Otaki Lions gathered to canvass the Otaki area for food parcels for the Otaki Foodbank. This was a combined Lions Clubs of Kapiti initiative where yellow appeal bags were delivered to homes across the region with an invitation to donate to their local foodbank. 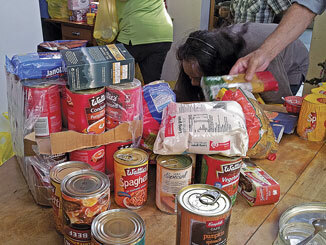 Items most needed included cereals, tinned goods, sugar, flour, baking ingredients, and toiletries. This was a first for the Otaki area and all items collected went directly to the Otaki Foodbank. Lions members divided up the town and beach areas and collected donated goods while tooting and thanking their way around the various streets. Back at the Food bank, manager Lucy Tahere, gratefully received any donated food to help restock her shelves and prepare for the increased demand placed on the Food bank over the Christmas period.